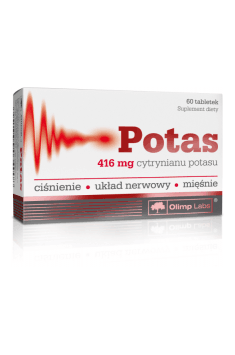 Olimp Potassium is a dietary supplement that replenishes potassium deficiency in the body. It is recommended particularly to people who train intensively, abuse salt and consume too few vegetables. The supplement is also beneficial in order to improve circulation and eliminate cramps. Potassium is one of the most important cations and electrolytes in the human body. Together with chlorides and sodium, it forms a very important component of extracellular fluids, ensuring the maintenance of a constant osmotic pressure. It is a component of the cellular cytoplasm and causes higher permeability of cell membranes, preventing cellular swelling. It acts antagonistically to calcium. It is an essential element of many reactions in the body, it participates in various enzymatic processes. Potassium is necessary for the synthesis of proteins in ribosomes. Therapeutically, it is used in conditions of potassium deficiency and in case of an overdose of digitalis glycosides (taken to stimulate the heart). Properly high potassium intake may reduce the risk of stroke, lower blood pressure and counteract the loss of muscle mass. Potassium content in blood is 3.5 - 5.5 mmol/l and up to 95% of the potassium present in the human body is in the intracellular fluid (there it is as high as 150 mmol/l). It is excreted in the urine and also during an intense physical exercise. The human body in 60% consists of water, 40% of which are intracellular fluids. The remaining 20% is in the blood, cerebrospinal fluid or between cells. The amount of water in extracellular and intracellular fluids depends on the concentration of electrolytes, in particular, sodium and potassium. Improper osmolarity may lead to heart and kidney problems. Potassium helps in the transmission of nerve impulses in the body. Therefore, it participates in the transmission of information from the brain to other parts of the body. This affects the better functioning of the heart, muscle contractility, and even a quick reflex. Reduced amount of potassium causes the ability to generate nerve impulses to decrease. The proper level of potassium is necessary to maintain the appropriate functioning of the nervous system cells. Too low potassium intake often affects excessively high blood pressure and the development of cardiovascular diseases. Usually, in order to lower the pressure, the amount of sodium consumed has to be reduced (individuals whose diet is mainly based on highly processed food and fast food are at the greater risk of excessive sodium consumption), while the proper supply of potassium is equally important. In addition, the mineral improves the functioning of the heart and regulates its rhythm. According to studies, the recommended daily amount of potassium (about 3.500-4000 mg per day) allows the reduction of the risk of death from ischemic heart disease by up to 49% (compared to the too low intake of 1000 mg/day). According to studies, adequate potassium intake may reduce the arterial stiffness, which turns out to be helpful in the treatment of atherosclerosis. It can also help to in the prevention of smooth muscle calcification. Prevention of calcifications is also a preventive action against kidney stones. Potassium allows maintaining an alkaline environment in the body. A disadvantageous condition for the organism is the metabolic acidity, causing nitrogen excretion, decreased bone mineral density and significant weakness and destruction of muscle. Supplementation of potassium helps in maintaining the optimal mass of bones (counteracting osteoporosis) and muscles. It is recommended in particular to elderly people and people with ketoacidosis (diabetic). Too low level of potassium is referred to as hypokalemia. Mild deficiencies usually do not manifest any symptoms, whereas in major potassium deficiencies fatigue, weakness, muscle pains as well as constipation may occur. Excess potassium deficiency leads to serious weakness and even muscle paralysis and sporadic cramps. These are accompanied by tingling, numbness, and itching, especially on the feet, hands and entire limbs. Constipation is then very painful, and respiratory function is threatened. In summary, Olimp Potassium is a dietary supplement that allows replenishing of potassium deficiencies resulting from improper diet and frequent and intense workouts. It is recommended especially for athletes and individuals who care about physical activity. It is also recommended for people who do not pay too much attention to a proper diet and consume large amounts of processed food. The supplement helps to eliminate muscle cramps, it may lower blood pressure, prevent excessive water retention, and facilitates transmission of nerve impulses. Take 2 tablets a day after a meal or as prescribed by your doctor. It is worth controlling the level of potassium in blood. When its level drops below 3,4 mmol/l in blood serum, it may entail very dangerous consequences for health. Lowered potassium level is observed as a result of diarrheas, vomiting, kidney functions disorders and taking diuretics. Fillers - microcrystalline cellulose, cross-linked carboxymethylcellulose sodium salt; binder - hydroxypropyl methylcellulose, anti-caking agents - silicon dioxide, magnesium salts of fatty acids.